SIMPLE FOLLOW-ALONG TAI CHI FOR HEALTH CLASS, with easy 'Demonstration' section, and detailed 'Instruction' section in a formal classroom setting. LET THE SUN SHINE IN! Master-teacher Ramel Rones gently guides you through the morning with a series of powerful mind/body exercises that awaken the senses, stimulate the mind, and fill your body and Spirit with abundant energy. Each day, millions of people worldwide practice Tai Chi Chuan, which has been known for centuries to promote deep relaxation and excellent health, to prevent injuries and illnesses, and to improve martial skills. Tai Chi has steadily become a popular form of Mind/Body exercise as more and more people in the west discover the rich rewards of living in a holistic way. Tai Chi is a journey through the mind, the body, and the spirit, that can be practiced by everyone. Increasingly, you can see people practicing in the park – moving slowly in a meditative state, or even perfecting their martial arts skills. But, what is Tai Chi really? This book clearly introduces the history and underlying principles of Tai Chi Chuan (taijiquan) from a modern and unique perspective. For the beginner, this program is a comprehensive introduction to authentic Tai Chi, allowing you to fine-tune your Mind/Body skills and create balance among them. For the intermediate and advanced, it includes important directions and instructions, helping you improve and expand Mind/Body knowledge. In the end, you will understand and experience the ultimate goal of Tai Chi; the harmonizing of the three forces – human, earth, and heaven. The Sunrise Tai Chi form is the protocol used at Tufts School of Medicine for the R-21 studies of healing rheumatoid osteoarthritis of the knee with tai chi. Captured in high-definition in the Boston's beautiful Arnold Arboretum, this simplified, short Tai Chi sequence is practiced to both the left and right for balance. 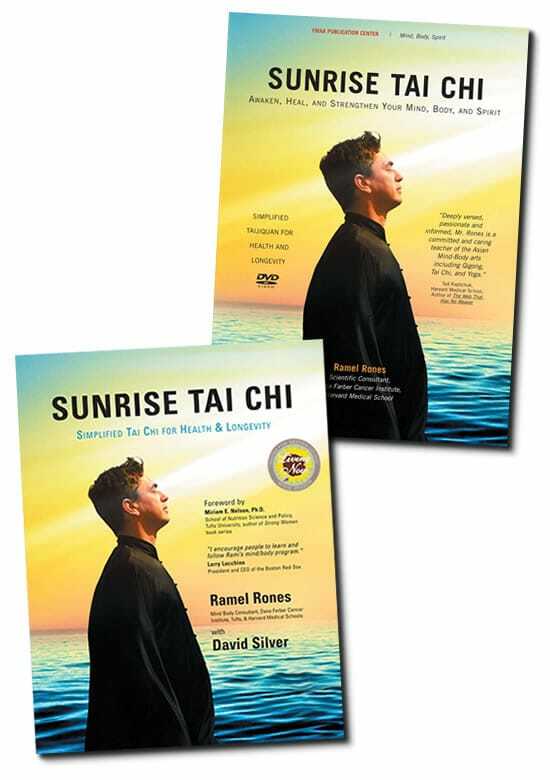 Sunrise Tai Chi was created as a comprehensive introduction to authentic Tai Chi, which will allow you to fine-tune your practice before moving on to more complex Tai Chi. It includes suggestions for intermediate and advanced students, to help you grow and improve over time. Each day, millions of people worldwide practice Tai Chi Chuan (Taijiquan), which has been known for centuries to promote deep relaxation, excellent health, & to prevent injuries & illness. The movements in Sunrise Tai Chi will help you to loosen & build your muscles, tendons & ligaments, which will improve your circulation of blood & Qi energy. The program also teaches you to find balance between strength & flexibility, increase bone density, & massage the internal organs, improving your quality of life & daily physical performance. This bestselling DVD has been in or near the #1 position for online sales of instructional Tai Chi DVDs since its publication. It was featured in an article on MSN and in Prevention magazine in September 2006.